I am preparing a book about the branch of this Caithness family who emigrated to Australia in 1825. Stewart Ryrie (born c.1776 at Bower, Caithness - died 1852 at "Arnprior," Braidwood, NSW) had been a Commissary in Wellington's army. His family of six were born at Thurso. About 1815 he moved to Edinburgh, where his sons were educated at the Royal High School. His first wife died and in 1825 Stewart, his new wife and the children of his first marriage sailed to Sydney where he took up a position with the colonial Commissariat. Stewart's sons obtained land grants and became notable pastoralists, especially in the Yarra Valley near Melbourne. One of the sons was the first man to climb Australia's highest mountain but his feat has been neglected by the history books. A second family of three was born in Sydney - their descendants included one of the best commanders at Gallipoli, who later became Australia's High Commissioner to the UK for 1927-32. Although the Ryries have often been mentioned in various publications, this is the first detailed account of their achievements as pioneers. is at an advanced stage of preparation and will be published by Norrong Press later this year or in early 2007. It will be a quality production with about 80 illustrations including a dozen in colour. 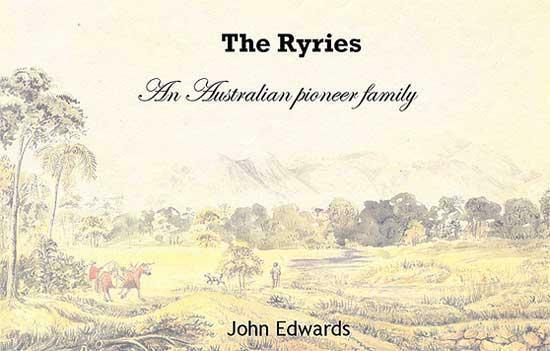 Although written from an Australian perspective, it will be of interest to members of the Ryrie family and history buffs around the world. It will be a limited edition and therefore subscribers are sought to raise the money necessary for printing. I hope to keep the retail cost down to around AUD30 (Approx. GBP12 or USD23 at time of writing). Plus postage & packing. My last book EDWARD BAKER BOULTON: AUSTRALIA'S FORGOTTEN ARTIST has met with considerable success. If you are interested in becoming a subscriber, please email me (John Edwards) at norrongpress[AT]ozemail.com.au Once I have a firm idea of the costing of the book, I will contact you and invite you to become a subscriber.